This time I actually logged my progress, thoughts, etc. I also describe the good and bad surprises of the platform and tools that I've encountered, hoping to ease the pain of other developers attempting to go down the same path I did. See the development log section below. I was pleasantly surprised by the development kit options offered by RIM. I chose the Native SDK, which is C/C++ based because I was familiar to using C for game development, as well as OpenGL from back in my university years. And of course, being closer to the hardware is cool in itself. 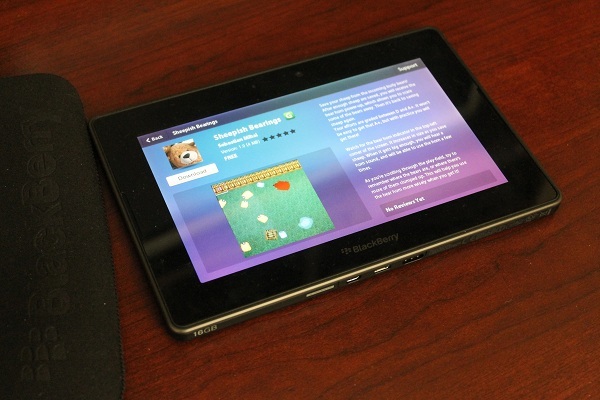 It took exactly two weeks from the day I bought the PlayBook, until the day I wrapped up production for the game. The game is very simple; touch sheep to save them from the roaming bears. After enough sheep are saved, you get a bear horn powerup, and can scare a few bears away by touching them. Your attempts are graded from D to A+. - install SDK (had to give permission to the Everyone group to directory in Program Files, told me I shouldn't have spaces in installation directory and then closed down on me). Ended up installing somewhere else. - have to wait for up to two hours until my request is approved. playing video games until I get the email. - after some hair-pulling attempts, playing an mp3 finally works... had to do with an extra slash in how the asset path was built. - brainstorm ideas. Tenets are: extremely simple UI/controls, whimsical graphics, semi-randomized levels, power ups. 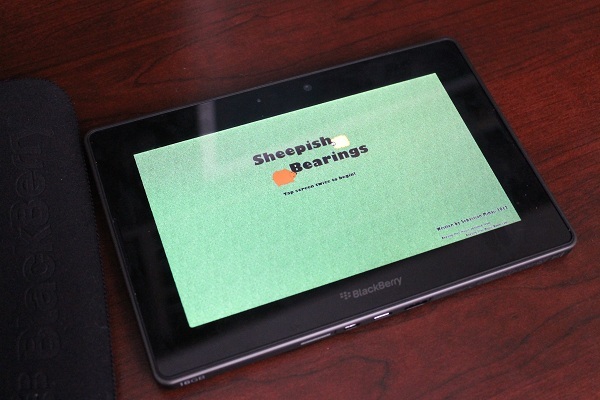 - first idea: "Sheepish Bearings" - save sheep from bears (and other animals?). Bears spawn and chase sheep. Do they de-spawn? After X sheep, you get a "dog" power-up. Message box tells you your next Y clicks will place dogs. Message box fades away by itself. Banjo background music. Differently-coloured sheep and bears. Touch sheep to "save" them (they fly to the top of the screen, or to a corner maybe, while diminishing in size. Another power-up: bear horn. Next Z clicks on bears will scare them. Circle-based bounding box collision detection. 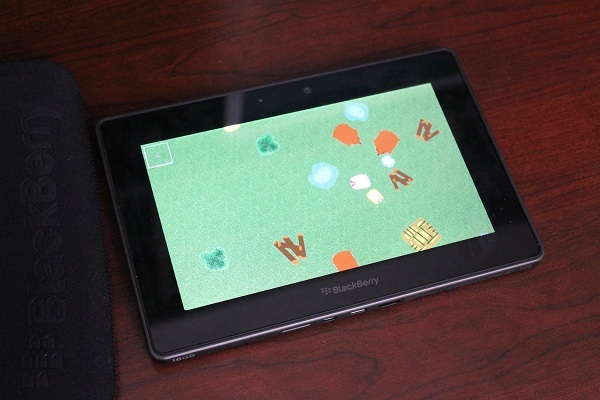 User should only have to 1.scroll playfield 2.click game objects. This means there are no "game menu" button, and power-ups don't have to be selected. It's more rigid, but I believe it greatly improves the UI interaction. Set spawn points for bears on each level. Levels look differently. No collision detection between animals (only with background and edges). Fence at edge of playfield, no scrolling past it. Score is in sheep, and is overlaid in a corner. Current power-up overlaid near score. Pick up a "region", rather than ONE sheep? (with bonus for multiple sheep?). Should all touches affect a circular area? - sound investigation. experimented with direct pcm playback, and then decided on using the mmr for sound effects as well, because it is much friendlier. Will use many mmr connections (for music, interface sounds, sheep sounds, bear sounds), OR a single connection for each type, and have the stop->start calls in a different thread, because stop->start sequences seem to lag quite a bit. - transparency - used GIMP on standard PNGs, and soon my textured polygons were transparent! - started drawing the textures. I wish I could draw. - created the "good" project, and migrated everything from the scrap one. Forced orientation to landscape. - description of sounds: "touch playfield"=short click "touch sheep"=no click "touch playfield during power-up"=bark! and horn! - description of music: southern, banjo lead during gameplay (I will need a free sequencer). Should menu music be different? - developed the audio module which provides functions to manage streams and initialize/terminate the audio system. - build/ran using Release configurations for the first time. All was ok.
- Playfield is textured. Sheep use two animation frames to move around, confined by the playfield boundaries. - Brainstorming, to add variety: both sheep and bears despawn by reducing in size to 0. Sheep despawn when eaten, bears despawn when scared by the bear horn. When bears and sheep spawn, they increase in size to the determined radius. With every eaten sheep, bears get bigger and faster. Saving sheep adds to score, eaten sheep detracts from score. Power-ups are based on a fixed number of saved sheep, and vary by level. Saved sheep fly off to the top of the screen. acquire dog power-up, place dog - woof! acquire bear horn power-up, use horn - horn sound! - added a touchscreen to game co-ordinates converter and cleaned up move/touch events. It keeps track of where the viewport scrolled and will be very useful for user input. There was some difficulty with the proper calculations, since the OS reports the Y co-ordinate upside down, both X and Y are 0-based, and also because we only move the viewport when a touch event was followed by a move event. - Brainstorming: change some of the obstacles to water, haystacks, logs, since they look good seen directly from above, and add variety to the backgrounds. - Brainstorming: possibly keep the "feeding mode"
- score will be rendered as a grade: D, C, B, A-, A, A+. Created textures for the grades (to be displayed on the main screen as "last attempt's score"
- Sheepish Bearings has been approved and is now up on BlackBerry App World!